Springsure, a rural town on the Dawson Highway, is 320 km west of Gladstone. It was named after the Springsure pastoral station, taken up by Sydney investors in 1860, including the New South Wales Registrar-General, Christopher Rolleston. The town is situated in undulating country over-looked by mountain ranges. Expedition Range to the east was named by Leichhardt (1844) and the Salvator Rosa range (the south) and Claude Range (to the west) were named by the New South Wales Surveyor-General Thomas Mitchell, in 1846. Despite these explorers' reports, pastoral settlement did not occur until the late 1850s, when the Comet River station, north-east of Springsure, was taken up. Further settlement quickly followed, and by 1864 a Springsure police district and a rudimentary township were defined. An improved road to Springsure across the Expedition Range was constructed in 1866. 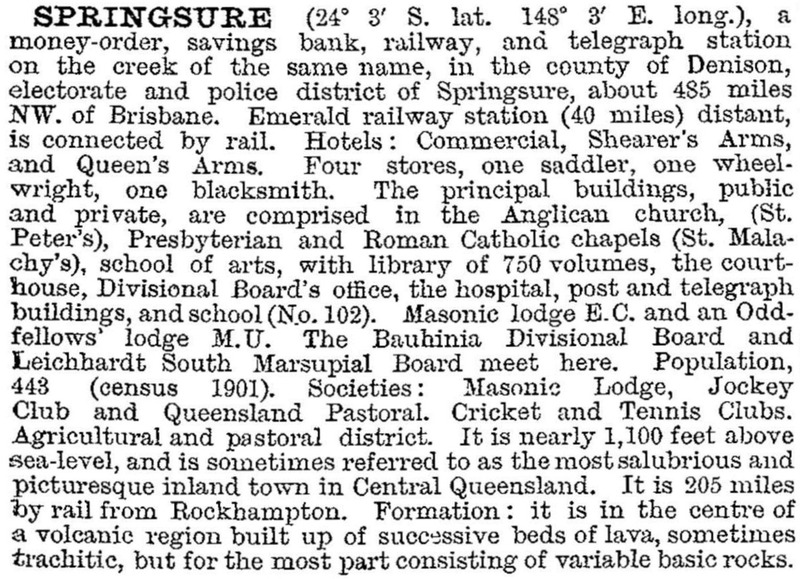 Springsure was the administrative centre of Bauhinia Shire (1879). Whilst the town's population slowly increased, the shire's decreased during the 1910s-40s. Prickly pear and weed pests, intermittent drought and the unsuitability of some land for sheep held back rural prosperity. Increases in grain crops and a further swing away from sheep to beef cattle restored prosperity. The town gained a multi-purpose hall, a swimming pool and a high school department added to the primary school (1964-65). In 1970 the town was fully sewered. Springsure has a local shopping centre, bowling and golf clubs, a racecourse and showground at Bauhinia Park, and three hotels or motels. The hospital (c1868) was converted to a museum in 1989, and Rainworth Fort (1862), south of Springsure, is a collection of historic buildings. Both sites are listed on the Queensland heritage register. Virgin Rock, on the other side of Springsure, is a vantage point for viewing Springsure and Carnarvon Range away to the south.